​When it comes to fish-finding equipment, Venterior is undoubtedly one of the most well-known brands on the market - not only are their products quite affordable but are also very easy to operate and sport an excellent build quality. We'll be taking a look at their Fishfinder with Wired Sonar Sensor Transducer, a popular model that comes at a reasonable price, with an LCD screen, audible fish alarm, and a high amount of portability. It sports a compact design and is a popular choice for newbies and occasional fishers - let's see if it's worth the money! Dimensions - 9.6" x 2.2" x 5.9"
As you can see in the pictures, this model comes with a simple LCD screen that displays data on a gray background. It uses simple graphics to show information, which includes things like the size of the sonar hits and the depth of the water. Fortunately, it comes with the necessary anti-UV coating that protects it in the sunny weather, giving the device a longer lifespan. Even though it looks simple, we were quite pleased with how it works. It displays information in an easy-to-see format, and we don't think that anyone will have any trouble with figuring out how it works. ​The Venterior VT-FF001 works at depths from 3 feet (1 meter) to 330 feet (100 meters). It's important to note that this is only the depth of the sonar and not of the cable - the included wire is only 25 feet long, which means that you'll be able to get readings only at 25 feet of depth. Unlike its sonar sensor and the transducer, the fish finder itself isn't waterproof, so we advise you to avoid submerging the model in the water. Another important thing is the fact that the finder can't detect fish smaller than 10cm, but we don't see this as a serious flaw. It works well with bigger fish, and it also displays things like weeds, rocks, and sand. The Venterior VT-FF001 works at depths from 3 feet (1 meter) to 330 feet (100 meters). It's important to note that this is only the depth of the sonar and not of the cable - the included wire is only 25 feet long, which means that you'll be able to get readings only at 25 feet of depth. Unlike its sonar sensor and the transducer, the fish finder itself isn't waterproof, so we advise you to avoid submerging the model in the water. One of the best things about this device is that it can be used for ice fishing. This works as long as the sensors are kept above 0 degrees Fahrenheit, and seeing as the temperature of the ice water is well above 30 degrees, this works just fine. Unfortunately, the model doesn't work so well in the swampy conditions because of the slit. The VT-FF001 comes with five different sensitivity settings, ranging from those that save your battery to those that display a full range of information. There's the battery-saving setting that turns the display off, the fish alarm setting that alerts the user when the fish is nearby, the backlight mode that makes fishing at night a lot more convenient, and others. The user is able to choose a setting that works best for him, which is pretty impressive for a device in this price category. ​The mounting hardware of this fish finder will let you attach it to your boat, providing you with hands-free operation. And due to its low weight, you can also use the neck strap to have it right there in front of you while fishing. The mounting hardware of this fish finder will let you attach it to your boat, providing you with hands-free operation. And due to its low weight, you can also use the neck strap to have it right there in front of you while fishing. 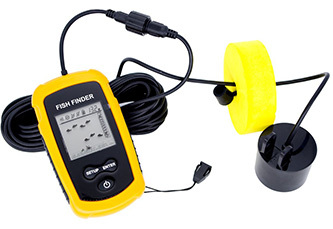 ​The setup of this fish finder is very fast and straightforward, which is always a big plus in our book. One only has to install four AAA batteries (whether they're rechargeable or single-use). The package also contains 25 feet of cable and a simple-looking rubber float, making the VT-FF001 ideal for kayaks and small boats. Another application would be to use it at docks and piers, as well as for the already mentioned ice fishing. It can be used in both freshwater and saltwater fishing environments. You'll have to throw sonar sensor and its rubber float into the water and attach the so-called side scan adapter to the side of your boat by using the included mounting hardware. If you plan on fishing in low-visibility conditions, you'll be pleased to find the backlight setting that makes this much more manageable. And in order to change the depth unit, one has to hold the Enter button for five seconds. Unfortunately, this model doesn't save the settings of your preference - once you turn it off, it forgets the settings, and you have to do it all over again. Like we already mentioned, the LCD screen of the VT-FF001 is a simple one, showing the necessary information on a gray background. This is not as fancy as the color screens of the more premium models, but it still does the trick. ​Unfortunately, this fish finder doesn't come with the capability to save the user's favorite settings - once you turn it off, it wipes them away, and you have to do it all over again the next time. We think that Venterior really should have had included this option, as the inability to keep your preferable settings can be pretty annoying at times. Unfortunately, this fish finder doesn't come with the capability to save the user's favorite settings - once you turn it off, it wipes them away, and you have to do it all over again the next time. We think that Venterior really should have had included this option, as the inability to keep your preferable settings can be pretty annoying at times. The setup of this fish finder is very fast and straightforward, which is always a big plus in our book. One only has to install four AAA batteries (whether they're rechargeable or single-use). The package also contains 25 feet of cable and a simple-looking rubber float, making the VT-FF001 ideal for kayaks and small boats. Another application would be to use it at docks and piers, as well as for the already mentioned ice fishing. It can be used in both freshwater and saltwater fishing environments. With no faults or flaws in its performance, this fish finder seems to be the best budget-friendly option for the fishing enthusiasts. It comes with a lot of handy features and all the necessary accessories to make every fishing session a more pleasant (and productive!) experience, and that's exactly what we expected from this manufacturer. With its battery--saving settings, backlight feature, mounting hardware, and the affordable price, the Venterior Fishfinder with Wired Sonar Sensor Transducer is an excellent choice and one that's definitely worth spending money on. We liked it!